You know you've won when you manage to sneak a CAT 5 point into the bathroom! Why fit a CAT 5 point into the bathroom ? Several reasons actually. As well as connecting medical sensors at some future point, the weighing scales could be connected to the network, so weight could be logged directly to a PC to keep a regular and accurate weight chart. I did think of fitting a load cell to the toilet seat, but that one has been vetoed. I would like in the long term to have some form of health monitoring setup (shades of Star Trek), so a basic heart monitoring (a simple electrocardiograph for instance) could be achieved and again, the monitor connected via the network point to a PC, with a small LCD display of health status in the bathroom. I've seen a possible solution with an electrocardiograph electronics project in the June 2002 issue of Everyday Practical Electronics magazine which may need further investigation. I don't know what else one could easily monitor, but there must be other life signs that can be monitored. 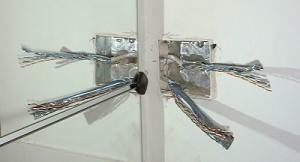 The room is equipped with 2 CAT 5e network points fitted in a single wall box. The 1-wire network extends into the bathroom via a DS1820 1-wire temperature sensor. At some point, hopefully a humidity sensor will also get fitted. This then gives some form of rudimentary envrionmental monitoring in the bathroom. The whole bathroom is finished with the exception of the Cat 5 network points which need to be plumbed in.